If you’ve ever flipped through the family album and groaned at some of the things you or a loved one wore in the past – be it a bridal gown or a suit worn for a particularly special occasion – you know firsthand how fashion can be a snapshot in time. 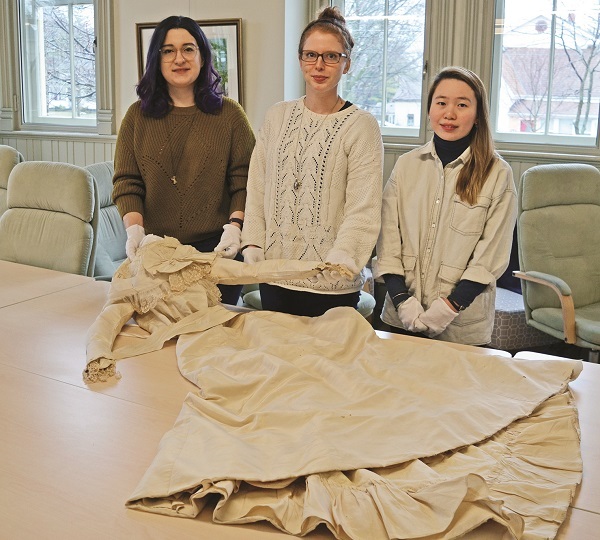 For the Aurora Museum and Archives, however, fashion can mean so much more; just a few garments can tell the story of a whole life, or a whole community, and it is this idea they are set to explore this spring in a new exhibition Births, Marriages and Deaths. Curated by Museum Studies students from the University of Toronto, the exhibit aims to illustrate the fabric of Aurora’s history through garments associated with the major milestones of a person’s life, through beautifully preserved christening and wedding gowns, uniforms, period mourning clothes and much more. The exhibition is the brainchild of Rachel Dice, a U of T student who has worked as a summer intern at the Aurora Museum of Archives. Joining the museum team, she jumped at the chance to work on textiles preserved in the collection, a passion she had since she was a child watching her mother, who owns a fashion design school. Ms. Dice’s area of expertise is actually historical literature, but when she got her hands on these local textiles, the creative juices began to flow. Joined by fellow students Carolyn Ben and Jessica Ho, they set an additional goal for themselves: narrating an exhibit through objects alone. Ms. Ho and Ms. Ben came into the project not quite as familiar with the stores within the Aurora Museum & Archives as Ms. Dice, but they were soon hard at work going through hundreds of pieces carefully stored in innumerable boxes. The guest curators say they each found birth, marriage and death equally interesting in their own right, the rites – and indeed the commercialization – surrounding death was particularly intriguing. Ms. Ho, on the other hand, is a champion of the marriage component in the exhibition. One area that is slightly lacking in the collection, she adds, are uniforms and other garments associated with the First World War. The trio of curators have a few theories on why that is; the prevailing one being that after the reality of the First World War – then known as simply The Great War as it was unlike anything they had ever experienced to that point – set in, people wanted no memory of it. They wanted it gone and saved very little. This extends beyond uniforms to the everyday clothing of that period which, at a time of shortage, were often cut down into rags and put to other uses.